One of the things that I think depression and trauma do is alter the reality of how we perceive life. Seeing the bad and the horror becomes commonplace. Only seeing the struggle is what many do every day. There are many that will sing the praises of happy thoughts or religious beliefs hoping to delay the what their mind tries to shove in front of them. It is almost as if they have become so numb and disconnected, but have done so without authenticity. No, I'm not saying that happy thoughts or religious beliefs don't have their place. They are one thing that we turn to because the going has gotten so rough. Sometimes they are the lifeline from one moment to the next. However, if we're not careful, these thoughts and beliefs will do as much damage as the horror negative attacks we place on our lives. They don't bring us into the body or the mind. Instead, they keep us as far away as they can. When the good stuff actually happens, we're so accustomed to feeling the negative and the horror, that we barely see the positive. Sometimes we've got our mind set on happy thoughts and religious beliefs, that we still miss the positive impacting us. 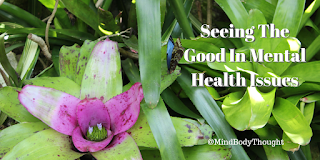 It is too easy to slip right by the good happening in our life, and that's sad because after a life of depression, anxiety, horror and trauma, we need to see some silver linings. If our mind and the body is stuck in neutral or in reverse, how will we ever travel the miles through the good that lies before us? I believe from my own experiences and what I have seen in others, that we need to learn how to experience the full breadth of our emotional existence. Whether it is negative thoughts, criticism, anger or happiness, love, and peace, we need the full range. Without the full range, we're not fully human. We are disconnecting and numbing parts of our life. Without sadness, can you understand happy? If you aren't in touch with anger, can you truly experience peace? If you don't know what criticism is, does love fully make sense? I'm not saying we stay in any one of these emotions, but we recognize them for what they are. We look at them as having a place to help bring us further into awareness and consciousness, not remain disconnected and numb. Finding our way through depression and mental health issues is challenging at best. However, let us make sure we don't keep ourselves from seeing the good, not just the bad. It is there if we allow ourselves to see it. Closing our eyes will not make it appear. Try to not forget the good with the bad. You may need to consciously remind yourself to look for the good, but it is there. Sometimes, it does take some effort to not let the negative completely take over our lives.